The new student accommodation for Newcastle University is becoming a reality thanks to innovative offsite construction solutions engaged by Space Architects. Established in 1834, Newcastle University is one of the oldest in the UK, and with a mission to achieve a global reputation for academic excellence, this new student village is a key strategic project to meet its growth targets for incoming students. Match this with the need to modernise existing student accommodation in line with its private sector competition, the new student village is part of an overall University-wide strategy central to its future plans. The new accommodation, which will house just under 1,300 students, is being delivered on the old Richardson Road site. The plans were unveiled two years ago by the University, with the construction due to be completed in August 2018. Space Architects, as Lead Consultant/ Project Architect, was appointed by Galliford Try to deliver the new accommodation for the University. Led by Keith Handy, Associate Director at Space Architects, the project costing approximately £68 million will see 1,277 student beds made available. These will be housed in six individual accommodation blocks, each containing a clusters of six to eight en-suite study bedroom apartments, which will share a lounge, kitchen and dining facilities. The majority of the development is delivered utilising offsite manufactured containerised ‘modules’. Once the ground-works are in place, these arrive on site, fully finished, and have minimal stitch up works within corridors before being fitted with an over cladding. The first modules began arriving on site in early April and Paul Bandeen, Head of Residences at Newcastle University, said: “After a long period of careful planning, it’s extremely exciting to see the first modules arriving and the accommodation starting to take shape, the speed of which they can be installed is impressive”. The modules themselves used in the development, are manufactured by the Chinese company CIMC-MBS, and are a result of careful collaboration between Space Architects, the University and Galliford Try. Space Architects’ involvement is post-planning, when it was asked to take on board a previous architect’s design which had not been specifically created with modular construction in mind. Keith Handy commented: “We played a key role in the post rationalisation of the original design, transforming it to ensure it would fit within the parameters of the CIMC modular system while maintaining the key design requirements requested by the University”. Together with Space Architects and Galliford Try, key stakeholders from the University visited the CIMC factory in China where they worked to ensure that the bespoke design requirements were incorporated. Paul Milburn, Project Director, Galliford Try, added: “We’ve worked closely with all stakeholders to ensure the transition of module design conception to delivery and installation on site is as seamless as possible. The end scheme is something everyone can be proud of”. 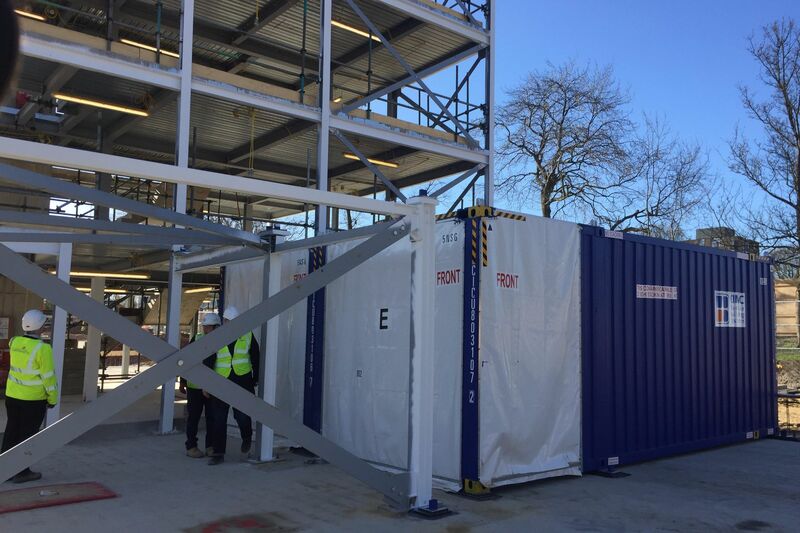 Offsite modular construction provides significant benefits to projects that include shorter construction programmes, reduced costs, less waste and consistent quality as a factory setting allows for strict plant conditions. From a health and safety point of view this means fewer on-site workers, naturally resulting in less accidents. Offsite construction is becoming more popular in the UK thanks to the array of benefits it provides over traditional construction methods. The UK government is recognising this through various announcements including the £3bn Home Building Fund which will direct some funding to modular housing. In addition to this, in January 2017 they launched the £1.7bn Accelerated Construction programme, which is aimed to exploit offsite construction methods to deliver up to 15,000 housing starts on surplus public sector land. Building Information Modelling (BIM) Level 2, has been used on this project – with many larger projects using BIM to deliver models which consist of both 3D geometrical and non-graphical data, Space Architects deployed this method to generate a seamless connection between design and construction stages. Space Architects also utilised both Virtual Reality and Augmented Reality to communicate the design to the client and CIMC. For example, they transferred a Revit model of the bedroom pods into a virtual reality environment which allowed the client to review the detailed design using a 3D headset and finalise details in advance of the visit to China. Using this technology meant they could have a ‘real’ feel for the space, and clarify all design requirements in advance. Keith Handy commented: “By using virtual reality methods, allowed us to visualise inside the space which in turn informed decisions on layout and positioning of utilities”. As part of the process to deliver an exemplary group of buildings, the team realised an opportunity existed to incorporate an energy efficient system and have since reached an EPC Design Rating of A for all accommodation blocks – the best rating possible. This will be delivered through the construction phase with a post construction evaluation and EPC certificate upon completion. The buildings exceed the standards required by Building Regulations and the British Standard for both acoustics and air quality, and they also comply with the Universities UK Code of Practice (for the management of Student Accommodation). To deliver on aspects of accessibility, the scheme has fully addressed the requirements of the DDA (The Disability Discrimination Act ) and complies with the Building Regulation and British Standard 8300: Delivery through BIM Level 2 and AR. Progress is continuing well on the site and students can look forward to modern accommodation that will suit their needs for decades to come. The speed of the construction process utilising offsite methods will slash the time it would normally take over traditional on-site methods with industry figures suggesting it can be 30%-60% faster*. Regarding the overall capital cost, modular building allows reductions of 10%-30% through greater efficiencies of design, delivery and onsite management. Reduced costings, increased speed, improved health and safety and using modern technology is surely the way forward if we are to meet the needs to house not only a growing student population but those in our wider society suffering a housing crisis.